ATLANTA — Just when you thought the NFL’s new national anthem policy couldn’t get more mind-boggling, the league and the NFL Players Association announced that the policy will not be enforced while the sides attempt to resolve the issue. This came hours after a report that the Miami Dolphins could discipline players who protest during the national anthem. The Dolphins’ new “Proper Anthem Conduct” policy would enable the team to punish players who protest during the song for “conduct detrimental to the club,” the same as driving drunk, sexual assault or domestic violence, according to The Associated Press. NFL owners revised the league’s anthem policy in May to fine teams whose players did not “display proper respect” during the playing of “The Star-Spangled Banner,” giving teams the option to pass those fines on to the players and giving the players the option of staying in the locker room during the anthem. The NFLPA has filed a grievance. The anthem policy is not sitting well with some NFL moms. I recently asked more than a dozen women at the Professional Football Players Mothers Association (PFPMA) conference in Atlanta about their views on the league’s new policy and uproar over players protesting during the national anthem. The consensus? They support their sons in using their platforms to bring awareness to issues affecting their communities and the communities in which they play. Other moms took a deeper approach. “When Muhammad Ali did his protest back in the day, everybody hated him. But by the time he died, he was a hero. So while you’re in it, people can’t understand what’s going on and the impact that you’re having,” said Sandra Atkins, wife of former Saints safety Gene Atkins and mother of Bengals defensive tackle Geno Atkins. In the NFL, you have to earn your place on the team, and according to these NFL moms, you should never have to earn what’s been given to you by your God and your country: the freedom of expression, your voice as a man. 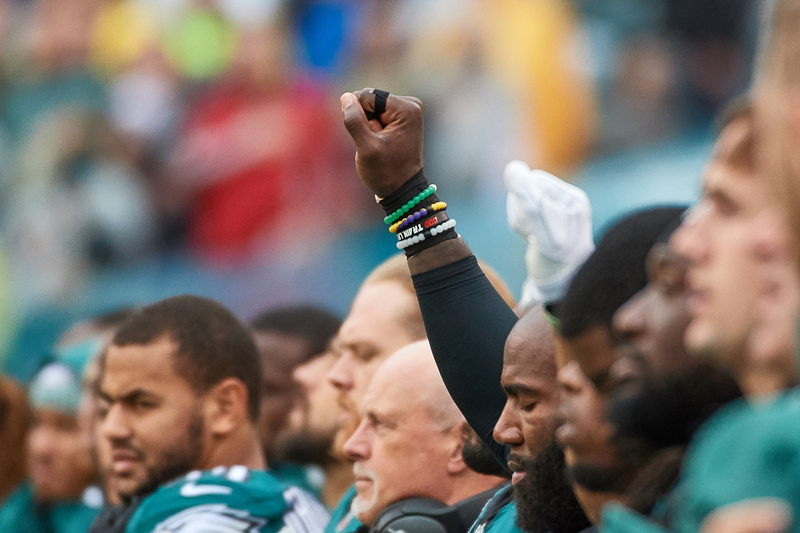 Philadelphia Eagles strong safety Malcolm Jenkins is seen holding up his fist in protest during the playing of the national anthem prior to the start of the game between the Eagles and the San Francisco 49ers on Oct. 29, 2017, at Lincoln Financial Field in Philadelphia. The moms I spoke with believe it’s their sons’ human right to stand on their principles, even if it makes others uncomfortable. They support their sons’ freedom of expression wholeheartedly. Whether they choose to kneel or stand, permission shouldn’t be needed. “I’m sorry that the world is missing the message; our country is missing the message. It’s not about the flag, because a lot of these players have people in the service,” said Joy Freeney, mother of retired defensive end Dwight Freeney. Many NFL players have family members in the military or on the police force, and they respect those entities. These moms say they’ve raised their sons to be men and they don’t believe their voices as men and as Americans should be silenced or confined. Freedom of speech should be a right, not a convenience. Jo Ann Pugh, mother of former Saints and Washington Redskins safety Jordan Pugh, said she looks at it from a holistic standpoint. “The beautiful opportunity of living in America is that we have the right to freedom of speech, and I think that the young men are doing what they feel they need to do, and I applaud them. For those who think they need to take another path, I applaud them. I think that’s the beauty to have the opportunity to express yourself in any way you feel most comfortable,” she said. With the Dolphins raising the stakes on the anthem policy, it’s only going to create deeper controversy and could increase player protests. Annie Apple is a journalist, writer, Founder & CEO of Raising A Pro 501C3 nonprofit, also an award winning Refrigerator Content Manager, Laudrytician and mom to The Ohio State Undisputed CFP Champ and N.Y. Giants cornerback Eli Apple.